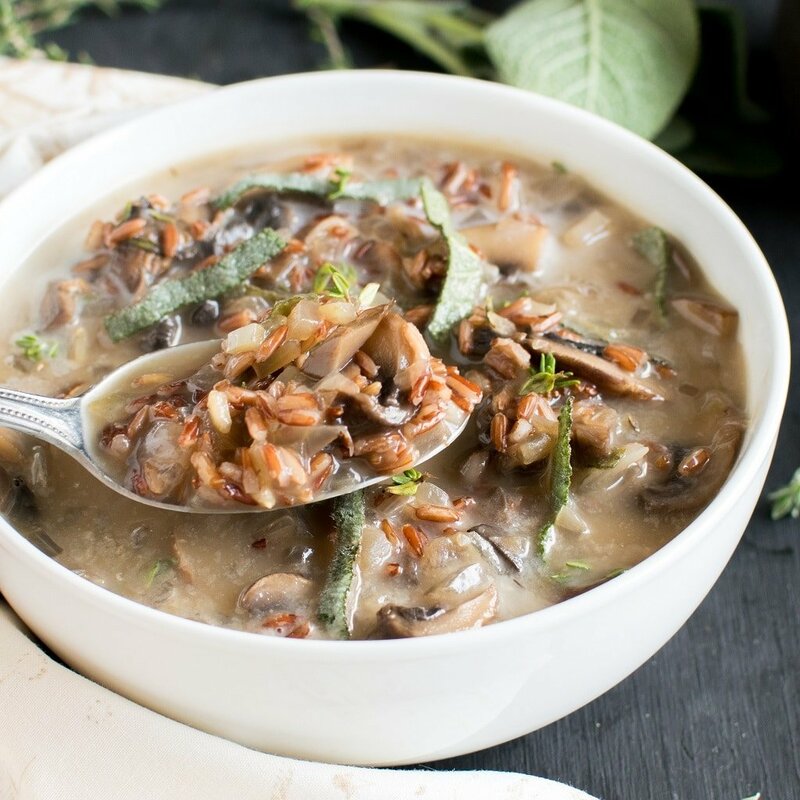 Vegan Mushroom Red Rice Soup is loaded with Vitamin D, fiber, iron and anti – oxidants. This wholesome and satisfying soup is flavorful and nourishes amazingly especially after a long tiring day. This soup is perfect for all season especially during winter in your cozy blanket. It’s not only easy but it’s a one pot soup. Simply throw all the ingredients in one saucepan and let it cook for 30 minutes on a low flame. Therefore without much baby siting this Vegan Mushroom Red Rice Soup will be ready to devour. I personally love Portobello Mushroom in fajitas or as stuffed. It is true that I have tried a couple of mushroom soups earlier but I am not a huge fan of it. However, when I decided on this soup recipe I simply fell in love with it. Since then I have been gorging on it and have already made it twice in a week’s time. 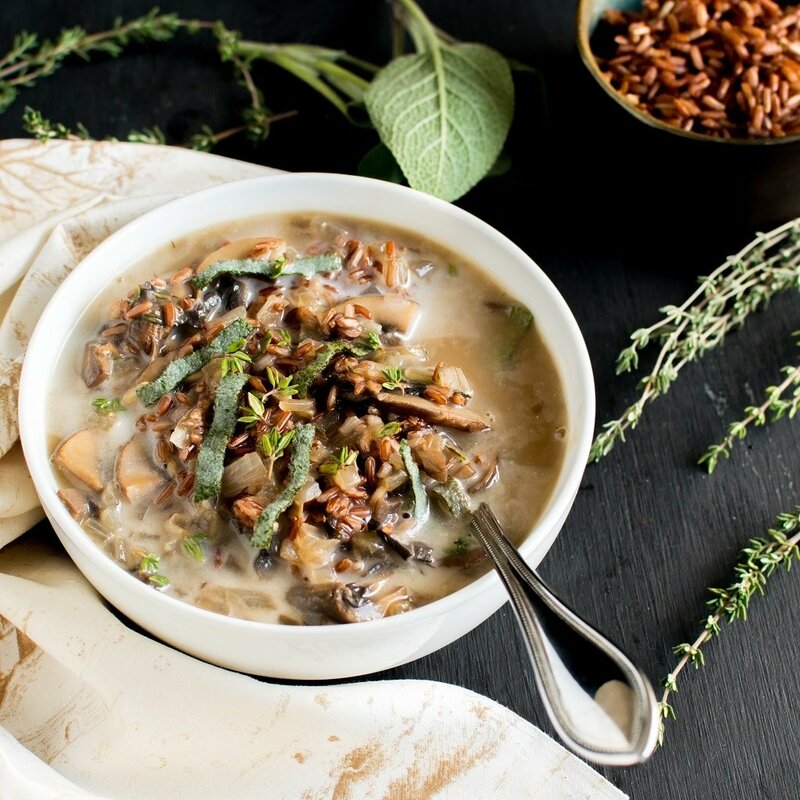 I wanted to create a mushroom soup that’s low in calories and high in nutrition along with being delightful. My idea was to keep it lighter in consistency as opposite to the creamy ones that we find in many restaurants. Those soups are no doubt delicious but extremely heavy. However, Vegan Mushroom Red Rice Soup is light and easy to digest and absolutely guilt free. I flavored this Vegan Mushroom Red Rice Soup with fresh sage and thyme herbs. It is oil free and also salt is optional if you use a very vegetable broth. Therefore, I must say this soup is low in sodium. So much health in just one delicious bowl makes it completely irresistible. This soup is totally perfect for healthy diet and is a great way to include some essential vitamins into our diet. This soup is packed with good carbohydrates and good fats that in turn helps in fat burning. 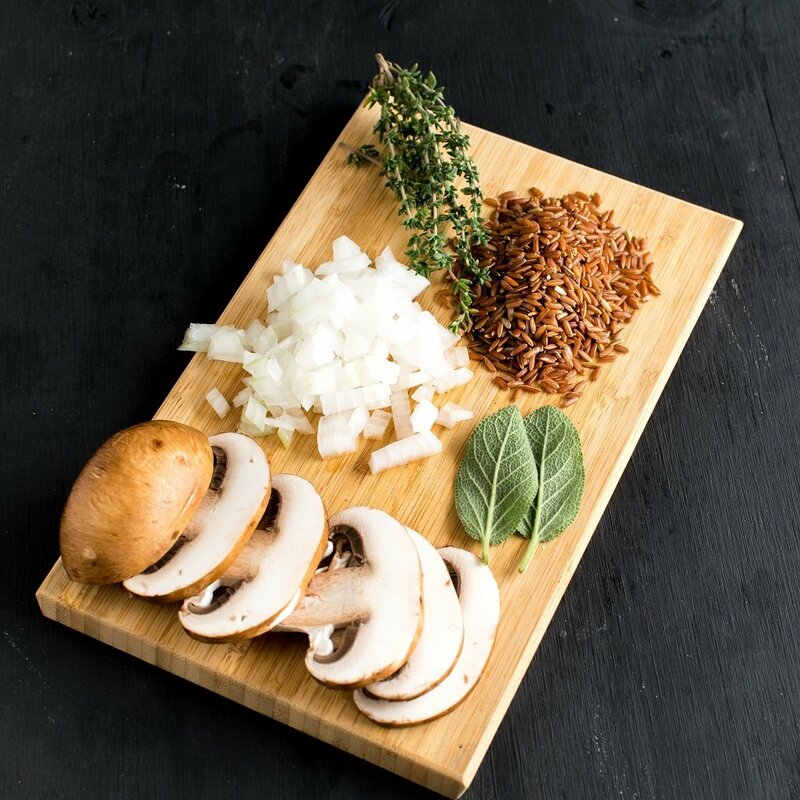 Vegan Mushroom Red Rice Soup is loaded with Vitamin D, fiber, iron and anti – oxidants. This wholesome and satisfying soup is flavorful and nourishes amazingly especially after a long tiring day. Place the mushrooms in your nonstick saucepan and let it cook covered for a few minutes until mushroom releases its juice. Now add onion, sage, thyme, rice and vegetable broth to it and mix. Cover and cook for 30 minutes on a low flame or until the rice is soft and chewy. Lastly add coconut milk and salt. Cook it in a low flame until the first boil. Finally, Turn off the flame and enjoy it immediately. I used baby Portobello mushroom for this soup recipe. To get the best effect you may cut the sliced mushroom from the center into halves and then cook. I used tetra pack coconut milk to get a lighter low calorie soup. You may use canned unsweetened coconut milk to give it a creamy and thicker consistency. However the calories would differ slightly. Also, this soup would taste excellent if you want to garnish it with cashew cream just before serving. However, you may use cashew cream if you use tetra pack coconut milk. If you use cashew cream with canned coconut milk this soup will become very heavy. While cooking if liquid is almost absorbed add ¾ cup of more vegetable broth and cook. Make sure rice is well cooked or else the soup will taste raw. You may refrigerate this soup but all the liquid will be absorbed. Therefore, in that case add more vegetable broth and little coconut milk to it. Then adjust salt and warm it to enjoy as a soup. Thank you RD . It indeed is filling and super healthy. This sounds amazing! I love recipes with sage because they scream Fall to me! I feel absolutely the same way. Thank you Franscesca for stopping by. Thank you Sandi. It indeed is nutritious and flavorful at the same time.